My grandparents and I visited an art show today. Naturally I wanted to walk around and see the crafts on my own terms, so I started talking to the merchants. 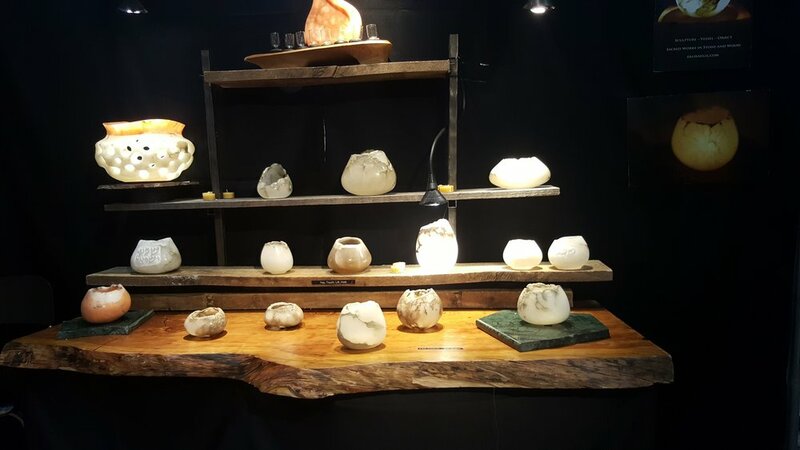 As I talked towards one aisle a booth caught my eye, a booth with rocks carved delicately into formations. "You first grind down the stone, get the outer shape right. Then I take a 4 watt motor and a grinding attachment, the same you'd use for auto body repair, something abrasive and it's just a belly dance from there." He proceeds to take the stone bowl and place it on his belly button, moving it left and right until he gets the movement across against the invisible motor. We proceed to talk about art, the artistic lifestyle and he mentions how artists are the modern-day hill people, secluding up to the hills for a period of time, and coming back down to civilization to interact before secluding again. He mentions the ancient societies of Southern Asia and their patterns of seclusion from society. They didn't read or write purposefully as separation from people to keep their autonomy.